Most rugged four-door/eight reader access controller to ensure unparalleled physical security. Spectra’s QuadXs 2C is engineered for optimum performance. It provides real-time monitoring of 4-doors access in all respects. It supports door-wise anti-pass backs. A prominent solution built for security; its controller and power supply units are protected with the suitable housing to avoid any accidental damages. It allows quick data transfers to a centralized server, making it extremely versatile and agile system to work with. 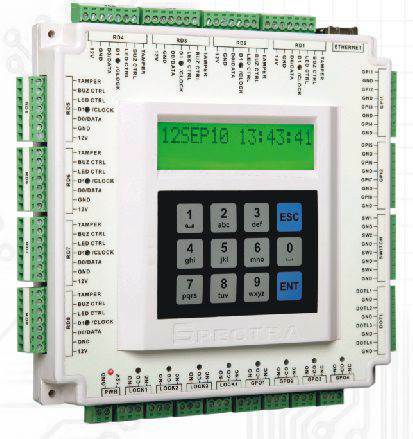 A logic-based solution that gives you complete control over your premises. It gives users the ease to set custom settings and exercise their rights, from individual to group doors. It saves time and ensures the tighter security of the premises than it is required. From field up-gradable software to fast data transfer the solution is a mark of Spectra’s unrelenting trust and quality.